A woman reconnects with her mother through her bridge club. For more than 50 years, a group of Jewish women in New Haven has gathered every Monday to eat lunch and play bridge. As a young child, Lerner (Food and Loathing: A Life Measured Out in Calories, 2003, etc.) was fascinated with these ladies, who showed up with “their hair frosted, their nylons shimmery, carrying patent leather pocketbooks with clasps as round as marbles.” But as a teenager, she thought these women were “square” because they “didn’t work, didn’t seem to get that Feminism was taking over the world….To me, the Bridge Ladies were conventional, their sphere limited to family, synagogue and community. Their identities restricted to daughter, mother, and wife. What could be more tedious? More demeaning? On top of which their idea of fun was an afternoon of playing Bridge. 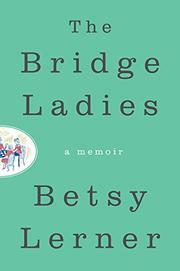 Seriously?” It was only when Lerner moved back to New Haven to help her aging mother that she began to understand the Bridge Ladies and their fierce loyalties and friendships that continued despite a certain level of boredom with each other. Lerner interviewed each of the women in turn, learning about their successes and failures, love interests, children, and ability to commit to one man for a lifetime. During this process, she also found ways to ask her mother about her own childhood. The author decided to learn how to play bridge, a task she found more difficult than she’d imagined. She interweaves her bridge-playing attempts with stories about the Bridge Ladies to give a portrayal of a certain sector of women who came of age before feminism was the norm. Lerner captures an era that has long since faded, but it is a time period that gave birth to today’s modern woman, a fact that shouldn’t be overlooked. Nostalgic stories from women who came of age before feminism and how they helped a daughter bond with her mother.